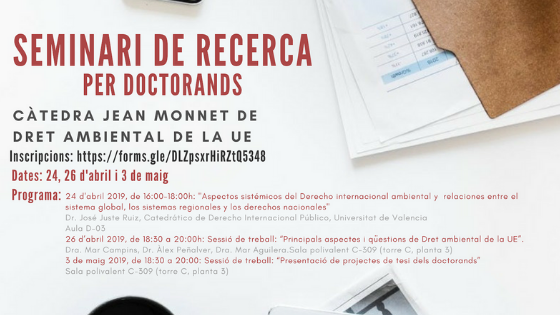 On April the 24th, 26th and May the 3rd EUEL is organizing a “Research seminar for PhD Candidates”. The seminar is structured as follows: During the openning session Dr. José Juste Ruiz will give a speach on “Aspectos sistémicos del Derecho internacional ambiental y relaciones entre el sistema global, los sistemas regionales y los derechos nacionales”, followed by a debate with assistants. Assistants shall fill the register form that appears when clicking the register image bellow.